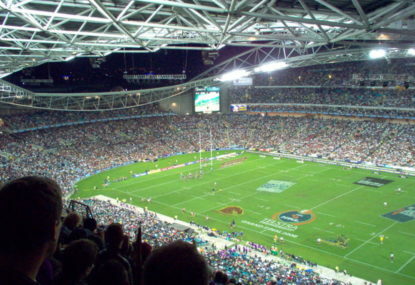 It's a huge day in Sydney for NRL Grand Final day (Wikipedia). Dual premiership-winning coach Chris Anderson fears rugby league may be dead in 10 years if the NRL doesn’t get its house in order. Anderson is pleading with “selfish” club bosses to end their war with ARL Commission chairman John Grant for the greater good of the game – or face catastrophic consequences. But while he is seriously concerned about the threat from AFL and soccer, those two rival football codes aren’t Anderson’s biggest worry. “Our biggest danger is rugby union,” the former Canterbury, Melbourne, Cronulla, Sydney Roosters and Kangaroos coach told AAP. “Not as in it taking it over, but a Murdoch or a Packer coming in and saying rugby union in Australia needs grassroots competition. They (the ARU) haven’t got enough money to make it happen. “We’ve got the best grassroots competition in Australia so if Murdoch came in and said to every player ‘we’re going to double your wages and you’re going to play rugby union next year’. “It’s a big world sport. It’s taken over Europe. Rugby league’s died in Europe. All good players now go to union; in England, in France. Anderson can understand NRL club bosses for being upset at having their promised funding from 2018 cut. But he’s still siding with Grant and the commission, who instead want to invest in grassroots rugby league to address declining player numbers. “There’s more than just NRL. The clubs don’t see that. They just see themselves,” Anderson said. “Clubs are a little bit selfish. I think the structure’s not right. The structure needs to be that the clubs can’t run head office. Head office has to run the clubs. “You can’t throw a ton of money at the clubs and not put it into development. “And we need to change the way that we’ve treated country rugby league. The demographics have changed there. “If we don’t change those things, rugby league will die. AFL are genius in grassroots (development). They throw a lot of money at grassroots. As well as rugby union, Anderson worries about the continuing surge of AFL and football on the back of the Socceroos’ three straight World Cup appearances.